1. How To Become a Seller? 2. What uploads are allowed to sold? 3. What guidelines are there for uploads for sale? 4. How will payments be made to Seller? 5. How will be the member notified of a sale? 6. How much will ShareCG charge for this service? 7. What rules must seller abide by? 8. How to give Feedback to ShareCG team? 9. What are the rules for Returns & refunds? 10. What are the rules for Chargebacks/ charge disputes? 11. How do I access Seller Agreement? 12. When should I update W9 form? 13. How do I access Detailed Account information? 14. How do I put an Upload “For Sale”? 15. How do I change price for an Upload? 16. How would I upload several files together? 1 How To Become a Seller? ShareCG requires that the seller be an accepted member of the ShareCG community. Go through the Seller Registration Process (login, click on ‘account info’ and then click on ‘Become a seller’ ). All sellers are required to have a Paypal account, and provide a real physical address, as it exists at PayPal. The seller must have a PayPal account that will be used by ShareCG for payments. The registration process requires $0.30(USD) registration fee through PayPal. This helps us verify your paypal account. For USA members, you are required to fill-out the W-9 form on-line. We will make every effort to approve them by the end of the next business day. As stated in the current policy, we reserve the right to reject any upload for any reason at any time. The sellers are responsible for setting the price for their uploads. Currently the minimum is $3.00 and max is $300.00. ShareCG reserves the right to change the price Range. Payment Mandates: PayPal email address is required, and a real physical address, as it exists at PayPal. Payment Method: ShareCG uses only Paypal to disburse payments. Getting Paid/ Earning Information Payment to the Seller will be posted in the Seller PayPal account on record within 15 business days, following the end of the selling month. Each time a member purchases an upload from the store, the purchaser receives an email confirmation of his purchase, and seller receives an email notification of the sale. Member is able to view all sales activities related to the member account in the ‘Reports’ tab in My Account. Fees may be changed at any time. The PayPal email on record with us is invalid. PayPal rejects our payment to the seller. We will make an attempt to contact the member through email on record. There is an unresolved copyright or any other type of issue complaint regarding any of the seller upload. Suspended payments will be paid on the next payment cycle if the problem is resolved. (the following month). All payments will be kept on hold, until all issues are resolved. Contact Us button at the bottom of all ShareCG pages is the easiest way to contact us. A team member will get back to you within a reasonable time of two business days. The Seller must guarantee full customer satisfaction and will accept returns for any reason. Request for return could be issued from us. 10. What are the rules for Charge backs/ charge disputes? 11. View the Seller Agreement? To REVIEW Seller Agreement, you must be logged inGoto Account Info tab, and Seller Agreement link is under your user-name. Otherwise, it will be available for viewing during the Seller registration Process. 12. When to update W9 form? We require a US resident to keep her/his W-9 current, unable to to comply might result in disqualification from selling. You can update the W-9 form by clicking on the W9 Tab and updating the form. 13. How to get Detailed Account Detail information? All eligible uploads, will have ‘Set Upload Price’ next to them. Add price and Save — this will Submit item to ShareCG team for approval. Item will show AS Pending , until it is approved – and will be visible to you in “my upload” only. After it is approved, price will be visible next to the item. 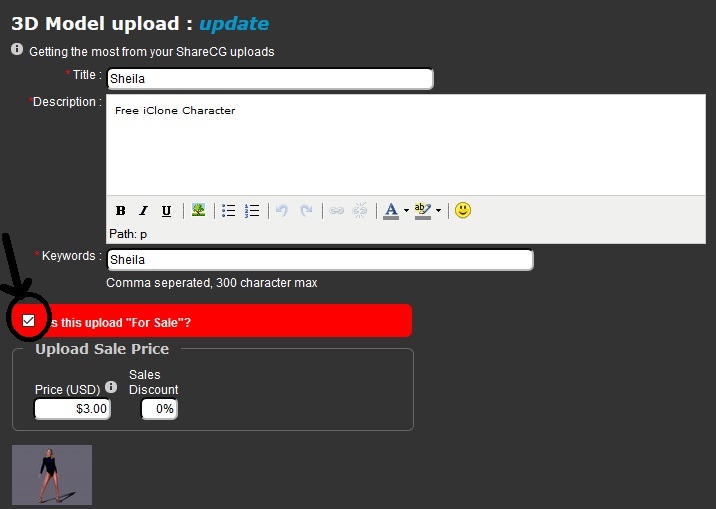 All Upload placed will be required to get an approval to be sold on SHARECG. It will not be available to download or purchase, until Team ShareCG approves it. 2. activate CheckBox next to For Sale. NOTE: Seller must own full rights to sell the upload on the store.After the member has been approved to be a seller. change it and Save it. Create one directory that contain your work and the *.obj file(s). It is preferred that you place them in separate sub-directories. Create a zip or rar file of the above directory. Although we support rar format, most people use zip. Load the zipped file as your upload. Our system will open the package and extract the files needed to display your 3D Modules. This entry was posted on Sunday, May 17th, 2015 at 4:55 pm. You can follow any responses to this entry through the RSS 2.0 feed. Both comments and pings are currently closed.